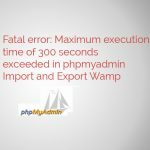 When you try to execute (some) queries in phpMyadmin if you get this error “Maximum execution time 300 exceeded”. If you are wamp please go to wamp\phpMyAdmin\libraries\config.default.php. Get Source Codes Copyright © 2019.